Workplaces come in all sizes so your waste and recycling service should fit your specific needs. A good contract can achieve some great outcomes like reducing costs, increasing recycling and improving amenity. Our waste and recycling contract guides will help you find the most appropriate service for your workplace. The two guides were developed by Sustainability Victoria and the Queensland Government but are applicable anywhere. Before engaging a contractor it's useful to know how much waste and recycling you workplace generates and what materials it includes. It's also and what types the business generates and what opportunities there are to minimise or avoid waste. If it's not measured you can't manage it! 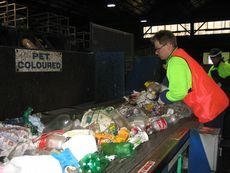 Take the time to undertake a waste audit and set some waste diversion targets. Sustainability Victoria's, Best Practice Waste and Recycling Contracts for Business guide, which outlines three simple steps that you can take to identify the best waste and recycling service and contract arrangement for your business including links and other resources for managing business waste and recycling. The Queensland Government's reThink Business Waste: A Guide to Reviewing Waste and Recycling Contracts and Service Agreements, which sets out a list of questions for reviewing a waste or recycling collection contract. It's also worth researching different waste and recycling options to find the best service for your business. Of course, it doesn't end there as your staff and cleaners need to be educated and reminded. That’s where useful resources such as BusinessRecycling signage and behaviour change tips are handy.